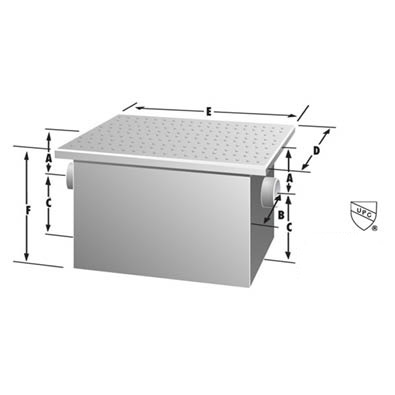 Furnish ______Rockford Model RP-______ PDI listed (thru 50 GPM only) all-welded steel interceptors for on-the-floor, partially recessed, or flush-with-floor installation, ______ g.p.m. intermittent flow, ______ lb. grease capacity, ______" no-hub inlet and outlet connections, flow control device, removable nonskid diamond treadplate cover for flush-with-floor installation suitable for pedestrian traffic or reinforced for light traffic, secured with stainless steel flat head screws, heavy-duty leakproof gasket. Units are furnished standard with enamel coating inside and outside. Supplied standard with air relief bypass. Bituminous coating outside for recessed installation optional at no extra charge. Tapped inlet/outlet connections, epoxy coating, integral extensions, and stainless steel construction. * Non-listed unit built in accordance with PDI G-101. All units standard with no hub connections. • Single bolt cover securement available.